At the time of it's original release, the PSP was very expensive and I wasn't too interested in another handheld device. Nintendo took care of that at a better price point for me. The PSP never really appealed to me until the device really faded with the NGP announcement. With shelves still stocked with used PSP titles, I decided it was time to snag a PSP 3000. The PlayStation Portable (officially abbreviated PSP) is a handheld game console manufactured and marketed by Sony Corporation Development of the console was announced during E3 2003, and it was unveiled on May 11, 2004, at a Sony press conference before E3 2004. The system was released in Japan on December 12, 2004, in North America on March 24, 2005, and in the PAL region on September 1, 2005. The PlayStation Portable is the first handheld video game console to use an optical disc format, Universal Media Disc (UMD), as its primary storage medium. Other distinguishing features of the console include its large viewing screen, robust multi-media capabilities, and connectivity with the PlayStation 2, PlayStation 3, other PSPs, and the Internet. After the release of a remodeled, slimmer, and lighter version of the PlayStation Portable, titled Slim & Lite, in early September 2007, sales quadrupled in the United Kingdom the following week and increased by nearly 200% in North America for the month of October. The PSP-3000 had a minor redesign including a new screen and inbuilt microphone, and has since been followed by the PSP Go. Sony first announced development of the PlayStation Portable at a press conference before E3 2003. Although mock-ups of the system were not present at the press conference or E3, Sony did release extensive technical details regarding the new system. Then-CEO of Sony Computer Entertainment Ken Kutaragi called the device the "Walkman of the 21st Century" in a reference to the console's multimedia capabilities. Several gaming websites were impressed by the handheld's computing capabilities and looked forward to the system's potential as a gaming platform. The first concept images of the PSP appeared in November 2000 at the Sony Corporate Strategy Meeting and showed a PSP with flat buttons and no analog stick. Although some expressed concern over the lack of an analog joystick, these fears were allayed when the PSP was officially unveiled at the Sony press conference during E3 2004. In addition to announcing more details about the system and its accessories, Sony also released a list of 99 developer companies that had pledged support for the new handheld. Several PSP game demos, such as Konami's Metal Gear Acid and SCE Studio Liverpool's Wipeout Pure were also shown at the conference. On October 17, 2004, Sony announced that the PSP would launch in Japan on December 12, 2004, at a price of ¥19,800 (about US$181 in 2004) for the base model and ¥24,800 (about US$226 in 2004) for the Value System. The console's launch was a success with over 200,000 units sold the first day. Different color variations were also sold in bundle packs, which cost more than usual, around $200. Sony announced on February 3, 2005, that the PSP would go on sale in North America on March 24, 2005, in one configuration for a MSRP of US$249/CA$299. Some expressed concern over the high price, which was almost US$20 higher than the system's price in Japan and more than $100 higher than the recently launched Nintendo DS. Despite the concerns, the PSP's North American launch was a success, although reports two weeks later indicated that the system was not selling as well as expected despite Sony's claim that 500,000 units had been sold in the first two days. The PSP was originally to have a simultaneous PAL region and North American launch, but on March 15, 2005, Sony announced that the PAL region launch would be delayed because of high demand for the console in Japan and North America. A month later, on April 25, 2005, Sony announced that the PSP would launch in the PAL region on September 1, 2005. Sony defended the high price, which was nearly US$100 higher than in North America, by pointing out that North American consumers had to pay local sales taxes and that the VAT (sales tax) was higher in the UK than the US. Despite the high price, the console's PAL region launch was a resounding success, selling more than 185,000 units in the UK alone, selling out of all stock nationwide in the UK within three hours of launch, more than doubling the previous first-day sales record of 87,000 units set by the Nintendo DS. The system also enjoyed great success in other areas of the PAL region with more than 25,000 units preordered in Australia and nearly one million units sold across Europe in the first week. Internal flash uses the FAT32 file system. Memory Stick media is compatible with both FAT and FAT32, although devices measuring 4 GB or more must use the FAT32 file system. ATRAC3 plus, AAC, WMA and MP3 support. The PSP-2000 (marketed in PAL areas as "PSP Slim & Lite" and still marketed as PSP in North America, Japan, China, India, Italy, and Portugal) is the first redesign of the PlayStation Portable. At E3 2007, Sony released information about a slimmer and lighter version of the PlayStation Portable. The new PSP was announced to be 33% lighter and 19% slimmer than the original PSP system. The model numbers were changed to PSP-2000, following the previous region-based numbering scheme (cf. the PSP-1000 numbering scheme of the "old" PSP model). It was released on August 30, 2007, in Hong Kong, on September 5, 2007, in Europe, on September 6, 2007, in North America, September 7, 2007, in South Korea and September 12, 2007, in Australia. On January 8, 2008, built-in Skype Wi-Fi Internet phone service was added via firmware updates. In comparison to the PSP-2000, the PSP-3000 (marketed in PAL areas as "PSP Slim & Lite (with enhanced screen + built in microphone)" and still marketed as PSP in North America and Japan) has an improved LCD screen with an increased color range, five times the contrast ratio, half the pixel response time to reduce ghosting and blurring effects, a new sub-pixel structure, a microphone, a new disc tray design, new button designs and logos, and anti-reflective technology to improve outdoor playability. It can also output all games by component or composite using the video out cable. In its first four days on sale, the PSP-3000 sold 141,270 units in Japan, according to Famitsu. 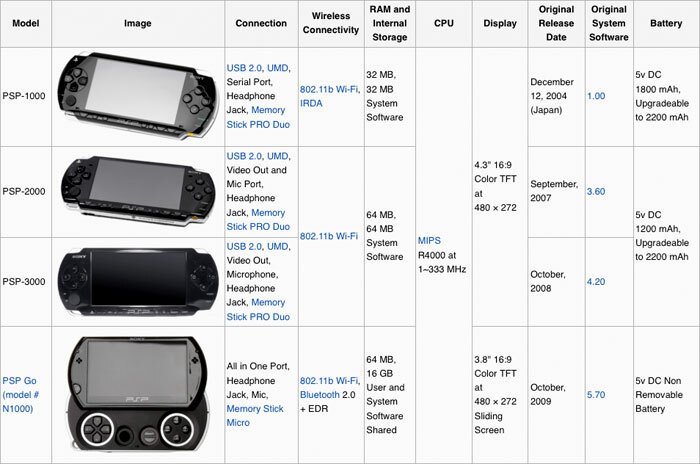 In October 2008, the PSP-3000 sold 267,000 units in Japan, according to Enterbrain. The PSP Slim & Lite system is 19% thinner and 33% lighter than the original PSP system (reduced from 23 mm to 18.6 mm and from 280 grams [9.87 ounces] to 189 grams [6.66 ounces]). Internal changes to achieve this include the removal of a metal chassis (used to reduce damage in the event of sudden trauma to the system resulting from the user dropping the system on a hard surface). However, users have complained about generally poor hardware assembly like misaligned faceplates and loose/creaky battery covers. Other changes include improved WLAN modules and Micro-controller, and a thinner and much brighter LCD. To target the original PSP generation's poor load times for UMD games, the internal memory (RAM and Flash ROM) was doubled from 32 MB to 64 MB, which also improved the web browser's performance. To make the PSP slimmer, the capacity of the battery was reduced by 1/3. However, due to more efficient power usage, the run time of the PSP is still the same as the previous model. Older model batteries will still work which extends the amount of playing time. However, the battery cover on the newer model does not fit over the older battery due to its bulkier size. The batteries take about one and a half hours to charge and last roughly 4.5-7 hours depending on factors such as screen brightness settings, WLAN and volume levels. In mid-December 2007, Sony released the PSP Extended Life Battery Kit, which includes a 2200 mAh battery with a battery cover that fits over the bulkier battery included, initially only available in North America. The kit comes with two new battery covers, one black and one silver. In March 2008 the Extended Battery Kit was released in Japan. However, unlike the North American kit, the batteries are sold individually with one specific cover. There are three separate kits; one kit includes a black cover, one includes a silver cover and one includes a white cover. The PSP Slim & Lite has a new gloss finish. The serial port was also modified in order to accommodate a new video-out feature (while rendering older PSP remote controls incompatible). In PSP-2000, PSP games will only output to external monitors or TVs in progressive scan mode, so televisions incapable of supporting progressive scan will not display PSP games. Non-game video outputs fine in either progressive or interlaced mode. USB charging was made possible (the PSP Slim will only charge while it is in "USB mode". It cannot be charged via USB when playing a game). However, there are unofficial USB charge plug-in downloads for charging the PSP with a USB without the need for being in USB mode. The D-Pad was raised in response to complaints of poor performance, while buttons offer improved responsiveness, confirmed in the GameSpot "hands-on" review: "several GameSpot editors have noticed that the d-pad and buttons on the new PSP provide a little more tactile feedback for a better overall feel." A new simpler and more compact UMD loading tray design was developed, in which the tray swivels out instead of opening up completely, while the Wi-Fi switch was moved to the top of the PSP. To address many consumer complaints about the Memory Stick door breaking off the old PSP, the Memory Stick door has been relocated and redesigned. The speakers were repositioned on the front of the PSP near the top of its screen. The infra-red port was also removed because it offered no use to the original PSP generation other than in homebrew applications. Its analog stick was also redesigned to be more flexible and is not removable without opening the PSP. The air vent at the top of the original was also removed. A "1seg" TV tuner (model PSP-S310) peripheral, designed specifically for the PSP Slim & Lite model, was released in Japan on September 20, 2007. Sony added TV output to the PSP Slim through Firmware update 3.60. It can output in a conventional aspect ratio (4:3) or widescreen (16:9), and offers a screensaver if the PSP is inactive for a set amount of time. It is able to output games, videos, and other media. To achieve TV output on the Slim model, Composite, S-Video, Component (YPBPR) and D-Terminal (YPBPR) cables are sold separately by Sony. PSP format games are output as a progressive scan signal, which can be carried only by the Component and D-Terminal cables, and displayed on televisions which support progressive scan. They are also rendered at the 480 × 272 resolution of the PSP screen, rather than the 720 × 480 resolution used for output, and are not upscaled meaning they are displayed with black windowboxing when viewed to an external display. This can be overcome on some TVs by using built-in zoom functionality. However, the PSP system software, music player and video playback are displayed in full-screen. As of firmware update 5.00, PlayStation (PSone) format software purchased from the PlayStation store is output in full-screen mode and optionally in interlaced format for non-progressive displays. Although the user needs component cables and a TV that supports 480p (mainly found in HDTVs) to play PSP format software, a homebrew plugin called "FuSa" allows anyone with a Slim PSP to view their games on any SDTV or HDTV using Composite or Component cables. The plugin is also advantageous to those with TVs that do support 480p because it allows a full screen (1:1 ratio) viewing of games. The maximum resolution through TV output is 720 × 480 pixels and composite video uses NTSC color encoding (no PAL composite signal is available; European TVs must be NTSC compatible to be used with a PSP via composite). The old PSP-1000 model is not capable of this feature due to a slightly different port. As a result, original PSP accessories (using the connector) will not work with the Slim and the Slim's accessories will not work with the original PSP. Sony has released a new version of the remote control accessory designed for the Slim as a result. The PSP Slim can still use 3.5 mm headphones, like the old PSP-1000. Sony confirmed a GPS Accessory for the United States at Sony CES 2008. The GPS is to be retailed for the new Slim PSP models. It will feature maps on a UMD, and offer driving directions and city guide. Limited Edition models began being released in Japan on September 12, 2007; North America on September 5, 2007; Australia on September 12, 2007; UK on October 26, 2007, and Europe on September 5, 2007. The PSP-2000 was made available in Piano Black, Ceramic White, Ice Silver, Mint Green, Felicia Blue, Lavender Purple, Deep Red, Matte Bronze, Metallic Blue and Rose Pink as standard colors (not all colors were available in all countries), and had several special edition colored and finished consoles for games including Final Fantasy VII: Crisis Core (Ice silver engraved), Star Ocean: First Departure (Felicia Blue engraved), Gundam (Red gloss/matte black), and Monster Hunter Freedom (Gold silkscreened) PSPs in Japan, Star Wars (Darth Vader silkscreened) and God of War: Chains of Olympus (Kratos silkscreened) PSPs in North America, a The Simpsons (bright yellow with white buttons, analog and UMD drawer) PSP in Australia and New Zealand, and Spider-Man (Red gloss/matte black), and Final Fantasy VII: Crisis Core (Ice silver engraved) PSPs in Europe. The PSP 3000, released on October 14, 2008, in North America, in Europe on October 17, 2008, on October 16, 2008, in Japan and in Australia on October 23, 2008, is currently available in Piano Black, Pearl White, Mystic Silver, Radiant Red, Vibrant Blue, Spirited Green, Blossom Pink, Turquoise Green and Lilac Purple. The Limited Edition "Big Boss Pack" of Metal Gear Solid: Peace Walker saw the release of a camouflage PSP while the God of War: Ghost of Sparta PSP special bundle pack will include a black and red two-toned PSP. The homebrew community were initially unable to hack the later PSP-2000s and the PSP-3000 because it had a new CPU (motherboards revealed to be TA-088v3 (for PSP Slim) and TA-090v2 (for PSP-3000)) which does not support the PRE IPL Exploit used in hacking the previous versions. This is due to the motherboard having its own PRE IPL where it checks the firmware thoroughly; if passed, the PRE IPL is cut off entirely to prevent unwanted modifications to the system. In November 2008, Datel announced a "Lite Blue Tool" battery which allows the PSP-3000 to boot into service mode. This battery is not able to start homebrew as the new PRE-IPL has yet to be cracked. The Lite Blue Tool was deterred from distribution due to legal action by Sony. Some time later, Datel changed the name from Lite Blue Tool to Max Power Digital and changed the description. MaTiAz, a known hacker in the PSP hacking community, found an exploit which is done with a US copy of Gripshift and a HEN save game exploit. However, this was only temporary. After the release of this initial hack, a sizable increase in sales of the game was experienced. Many eBay sellers inflated their prices to cash in on the sudden demand. A revised version of the PSP firmware (v5.03) was released shortly after to patch the exploit. Malloxis found a TIFF crash which is proven to work on 5.02 and 5.03 firmwares for PSP-3000; further crafted and engineered by MaTiAz, the TIFF crash became a TIFF exploit capable of loading an h.bin from the root memorystick. Davee, another hacker, further engineered this exploit with a privilege escalation exploit and created a Homebrew Enabler (HEN) which would allow the execution of unsigned code by users. In firmware revision 5.50, the TIFF vulnerability was removed, preventing any further firmwares being affected by the exploit. The HEN for the TIFF exploit, which was called "ChickHEN", was released on May 5, 2009. On June 5, 2009, custom firmware version 5.03GEN-A for HEN was released, which is compatible with both PSP-2000 v3 and PSP-3000. It allows users to play game backups (ISO/CSO), PS1 games, and includes access to PSN, VSH, and recovery mode. This marked a major step forward in ending Sony's PSP-3000 piracy protection. Two days later, on June 7, 2009, a duo of hackers (Xenogears and Becus25) released custom firmware support software based on a modified work of the released 5.03GEN-A for the formerly unhackable handheld called "Custom Firmware Enabler 3.01" in which PSP-3000 users can install custom firmware and load those firmware's files onto the PSP's RAM with the direct usage of "ChickHEN". On March 29, 2010, a user-mode exploit was revealed in the demo of the game Patapon 2. This was quickly followed by the public release of "Half-Byte Loader", a piece of software allowing to load homebrew software on all PSP models (including the PSP Go) running firmwares less than 6.30. HBL has also been ported to Everybody's Golf, allowing HBL to run on 6.30 and 6.31 firmwares. On December 24, 2010, Total_Noob's HEN (6.20 TN-A) was made available which allows Homebrew and ISO Loaders to run on any PSP Console with the 6.20 firmware. On December 30, 2010, Total_Noob updated his HEN to the version B (6.20 TN-B), which featured a way to downgrade ALL the PSPs, including those with TA-088v3 motherboard, 3000+ and Go, breaking the long-established "barrier" that prevented these PSP versions from downgrading. On January 2, 2011, Mathieulh announced the discovery the PSP's master keys, allowing homebrew to run on the PSP without any firmware modifications. On March 13, 2011, Virtuous Flame & ColdBird updated his HEN to the Version B3 (6.35 PRO-B3), the ability to run ISO and CSO backups, to run Homebrew games and applications, to run PS1 Games, run Plugins and can use to access the PSN. On some occasions, scan lines may appear on scenes where brightness changes drastically, due to the hardware features of the new LCD device on PSP-3000. Installed with this new LCD device, PSP-3000 offers more natural and vibrant colors on its screen, but the scan lines have come out to be more visible as a result of improving response time to alleviate the afterimages on PSP-3000. Since this is due to hardware specification, there are no plans for a system software update concerning this issue. The PSP Go was revealed on May 30, 2009, in the June episode of the PlayStation Network online magazine Qore and was later officially announced on June 2, 2009, at E3 2009. The PSP Go features Bluetooth functionality, a smaller 3.8-inch (97 mm) screen and weighs 43% less than the original PSP. Instead of the UMD drive as found on previous models, the PSP Go has 16 GB of internal flash memory and a Memory Stick Micro port that accepts cards up to 16 GB. Currently, the PSP Go has a max memory of 32 GB, but the M2 memory can be increased in firmware updates. Games must be downloaded from the PlayStation Store. The sliding mechanism on the screen hides the main face buttons and the analog 'nub' when not in use. With the release of the PSP Go, most future PSP games will also receive a PlayStation Store release, whereas only a handful of games were available before. Sony announced in April 2011 that it will stop production of the PSP Go to focus resources on developing the NGP. Shortly after, SCEA clarified that the PSP Go would still be produced for the North American market. The PlayStation Portable uses the common "slab" or "candybar" form factor, measures approximately 17 x 7.3 x 2.2 cm (6.7 x 2.9 x 0.9 in), and weighs 280 grams (9.88 ounces). The front of the console is dominated by the system's 11 cm (4.3 in) LCD screen, which is capable of 480 x 272 pixel video playback with 16.77 million colors. Also on the front are the four PlayStation face buttons (Triangle, Circle, X, Square), the directional pad, the analog 'nub', and several other buttons. In addition, the system includes two shoulder buttons and a USB 2.0 mini-B port on the top of the console and a WLAN switch and power cable input on the bottom. The back of the PSP features a read-only UMD drive for movies and games, and a reader compatible with Sony's Memory Stick Duo flash cards is located on the left of the system. Other features include an IrDA compatible infrared port (discontinued in PSP-2000 and later series), built in stereo speakers and headphone port, and IEEE 802.11b Wi-Fi for access to the Internet, ad-hoc multiplayer gaming, and data transfer. The PSP uses two 333 MHz MIPS32 R4000-based CPUs, a GPU with 2 MB onboard VRAM running at 166 MHz, and includes 32 MB main RAM and 4 MB embedded DRAM in total. The hardware was originally forced to run more slowly than it was capable of and most games ran at 222 MHz. However, with firmware update 3.50 on May 31, 2007, Sony removed this limit and allowed new games to run at a full 333 MHz. The PSP includes an 1800 mAh battery (1200 mAh on the 2000 and 3000 models) that will provide about 4-6 hours of gameplay, 4-5 hours of video playback, or 8-11 hours of audio playback. Official accessories for the console include the AC adapter, car adapter, headset, headphones with remote control, extended-life 2200 mAh battery, battery charger, carrying case, accessories pouch and cleaning cloth, and system pouch and wrist strap. Sony has included the ability for the operating system, referred to as the System Software, to be updated. The updates can be downloaded directly from the Internet using the [System Update] feature under [Settings] in the XMB. Alternatively, they can be downloaded to a computer from the official PlayStation website, placed on a Memory Stick Duo (Memory Stick Micro for PSP Go models) in following directory: PSP > GAME > UPDATE > EBOOT.PBP, and subsequently installed on the system. Updates can also be installed from UMD game discs that require the update to run the game. The Japanese version of the PS3 allows the System Software to be updated by downloading the System Software onto the Hard Drive then to the PSP. Sony has prevented users from downgrading the PSP to an earlier version of the System Software that is currently installed. While System Software updates can be used with consoles from any region, Sony recommends only downloading updates released for the region corresponding to the system's place of purchase. System Software updates have added various features including a web browser; Adobe Flash support; additional codecs for images, audio and video; PlayStation 3 connectivity and patches against several security exploits, vulnerabilities and execution of homebrew programs. The most current version is v6.38. The version 2.50 upgrade added Unicode (UTF-8) character encoding and Auto-Select as options in the browser's encoding menu, and also introduced the saving of input history for online forms. Version 2.70 of the PSP's system software introduced basic Flash capabilities to the browser. However, the player runs Flash version 6, four iterations behind the current desktop version 10, making some websites difficult to view. There are three different rendering modes: "Normal", "Just-Fit", and "Smart-Fit". "Normal" will display the page with no changes, "Just-Fit" will attempt to shrink some elements to make the whole page fit on the screen and preserve layout (although this makes some pages extremely difficult to read), and "Smart-Fit" will display content in the order it appears in the HTML, and with no size adjustments; instead it will drop an element down below the preceding element if it starts to go off the screen. The browser also has limited tabbed browsing, with a maximum of three tabs. When a website tries to open a link in a new window, the browser opens it in a new tab. Parents can limit content by enabling Browser Start Up Control which blocks all access to the web browser and creating a 4-digit PIN under [Settings] in [Security]. Additionally, the browser can be configured to run under a proxy server and can be protected by the security PIN to enable the use of web filtering or monitoring software through a network. Recently, TrendMicro for PSP was added as a feature that can be enabled via a subscription to filter or monitor content on the PSP. The PSP browser is slower compared to modern browsers and often runs out of memory due to limitations put in place by Sony. Alternatively, Homebrew has allowed a custom version of the browser to be released that utilizes all 32/64 MB of the PSP's RAM, which allows the browser to load pages faster and have more memory for larger pages. Opera Mini can also be used on PSP through PSPKVM, a homebrew application which is a Sun Java Virtual Machine. It was claimed to provide much faster loading times than the default browser and provides better web page capability. Remote Play allows the PSP to access many features of a PlayStation 3 console from a remote location using the PS3's WLAN capabilities, a home network, or the Internet. Features that can be used with Remote Play include viewing photos and slideshows, listening to music, watching videos stored on the PS3's HDD or on connected USB devices, and several other features. Additionally, Remote Play allows the PS3 to be turned on and off remotely and allows the PSP to control audio playback from the PS3 to a home theater system without having to use a television. Although most of the PS3's capabilities are accessible with Remote Play, playback of DVDs, Blu-ray Discs, PlayStation 2 games, most PlayStation 3 games, and copy-protected files stored on the PS3's hard drive are not supported. Starting with system software version 3.90, PSP-2000, PSP-3000 and PSP-N1000 can use the Skype VoIP service. The PSP-2000 requires a headset for this feature while the microphone is built into the PSP-3000 and PSP-N1000. Due to hardware constraints, it is not possible to use the VoIP service on PSP-1000. The service allows Skype calls to be made over Wi-Fi and on the PSP Go over the Bluetooth Modem feature. Users must purchase Skype credit in order to make calls to non Skype devices such as a landline or mobile phone. Announced at TGS 2009, a similar service to PlayStation Home, the PlayStation 3's online community-based service, was being developed for the PSP. Named "Room" (officially spelled with capital letters and the infinity symbol in place of the "oo"), it was being beta tested in Japan from October 2009 to April 2010. It was able to be launched directly from the PlayStation Network section of the XMB. Just like in Home, PSP owners would have been able to invite other PSP owners into their rooms to "enjoy real time communication." Development of Room halted on April 15, 2010, due to the feedback of the community. Sony has partnered with publishers such as 2000AD, Disney, IDW Publishing, Insomnia, iVerse, Marvel and Titan to release digitized comics on the PlayStation Store. This new application requires PSP firmware 6.20 for it adds a new XMB category called "Extra". The Digital Comics Reader application can be downloaded on the PlayStation Comics official website. The PlayStation Store's "Comic" section launched in the United States and English speaking PAL regions (United Kingdom, Ireland, South Africa, Australia, New Zealand) on December 16, 2009, though the first issues of Aleister Arcane, Astro Boy: Movie Adaptation, Star Trek: Enterprise Experiment and Transformers: All Hail Megatron were made available as early as November 20 through limited time PlayStation Network redeem codes. The service premiered in Japan on December 10, 2009, with licensed publishers Ascii Mediaworks, Enterbrain, Kadokawa, Kodansha, Shueisha, Shogakukan, Square-Enix, Softbank Creative (HQ Comics), Hakusensha, Bandai Visual, Fujimishobo, Futabasha and Bunkasha. In early 2010 the application expanded to German, French, Spanish and Italian languages with Digital Comics available in the respective European countries. The choice of regional Comic Reader software is dictated by the PSP's firmware region, and cannot be chosen. The Japanese Comic Reader will not display comics purchased from the European store, and vice versa. So although a Japanese PSP can log into the European Playstation Store and purchase and display videos and games bought there, any comics purchased cannot be displayed. In addition to playing PSP games, several older PlayStation games have been rereleased and can be downloaded and played on the PSP via emulation. Currently, the only three official ways to access this feature are through the PlayStation Network service for PlayStation 3, PSP, or a PC. Demos for commercial PSP games can be downloaded and booted directly from a Memory Stick. Demos are also sometimes issued in UMD format and mailed out or given to customers at various retail outlets as promotional content. During E3 2006, Sony Computer Entertainment America announced that the Greatest Hits range of budget titles were to be extended to the PSP system. On July 25, 2006, Sony CEA released the first batch of Greatest Hits titles. The PSP Greatest Hits lineup consist of games that have sold 250,000 copies or more and have been out for nine months. PSP games in this lineup retail for $19.99 each. On June 15, 2005, hackers disassembled the code of the PSP and distributed it online. Initially the modified PSP allowed users to run custom code and a limited amount of protected software. Sony responded to this by repeatedly upgrading the software. Over time people were able to unlock the firmware and allow users to run more custom content and more protected software. One of the ways hackers were able to run protected software on the PSP was through the creation of ISO loaders which could load copies of UMD games from the memory stick. The PSP received generally favorable reviews soon after launch and most reviewers cited similar strengths and weaknesses. CNET awarded the system an 8.5 out of 10 and praised the console's powerful hardware and its multimedia capabilities while lamenting the lack of a screen guard or a guard over the reading surface of UMD cartridges. Engadget applauded the console's design, stating that "it is definitely one well-designed, slick little handheld". PC World commended Sony's decision to include built-in Wi-Fi capability, but criticized the lack of a web browser at launch and the glare and smudges that resulted from the console's shiny exterior. Most reviewers also praised the console's large and bright viewing screen and its audio and video playback capabilities. In 2008, Time listed the PSP as a "gotta have travel gadget", citing the console's movie selection, telecommunications capability, and upcoming GPS functionality. The PSP Go received mixed reviews to date. IGN gave the product a 7.2 stating that with the absence of the UMD slot, the PSP Go is difficult to consider for purchase. Sony admitted in late 2005 to hiring graffiti artists to spray paint advertisements for the PSP in seven major U.S. cities including New York City, Atlanta, Philadelphia, and San Francisco. The mayor of Philadelphia has filed a cease and desist order and may file a criminal complaint. According to Sony, it is paying businesses and building owners for the right to spraypaint their walls. In 2006, Sony ran a poster campaign in England. One of the poster designs with the slogan "Take a running jump here" was removed from a Manchester Piccadilly station tram platform due to concerns that it might encourage suicide. In July 2006, news spread of a billboard advertisement released in the Netherlands which depicted a white woman holding a black woman by the jaw, saying "PlayStation Portable White is coming." Some found this to be racially charged due to the portrayal of a white woman subjugating a black woman. Two other similar advertisements also existed, one had the two women facing each other on equal footing in fighting stances, while the other had the black woman in a dominant position on top of the white woman. The stated purpose of the advertisements was to contrast the white and black versions of its game console available for sale. These ads were never released in the rest of the world, and were pulled from the Netherlands after the controversy was raised. Despite having been released only in the Netherlands, the advertisement gathered international press coverage. Engadget notes that Sony may have hoped to "capitalize on a PR firestorm". Sony came under scrutiny online in December 2006 for a guerrilla marketing campaign hoping to go viral, for the console, with advertisers masquerading as young bloggers who desperately wanted a PSP. The site was registered to and created by the St. Louis, Missouri, advertising firm Zipatoni on behalf of Sony before it was taken down. In an interview during PAX 2010, Mortal Kombat Executive Producer Shaun Himmerick revealed a successor to the PSP, the "PSP2", stating "... we have a PSP2 in the house and we're looking at the engine, like what can it support. Always a big thing for us is the performance. We're running at 60 fps, what can we do and do we have to build all the art assets over. We're definitely looking at them. PSP2 looks like it's a pretty powerful machine." The new handheld was officially announced on January 27, 2011 at a "PlayStation Meeting" in Japan, with the codename Next Generation Portable (NGP).